Modular design pieces allow partners to scale and customize their experiences and services. An 8' x 8' x 8' steel frame makes up UNIT A, the base module that can be repeated as program requires. On top of this 8' cube sits a pitched skylight to allow for maximum air and light to come through the space. 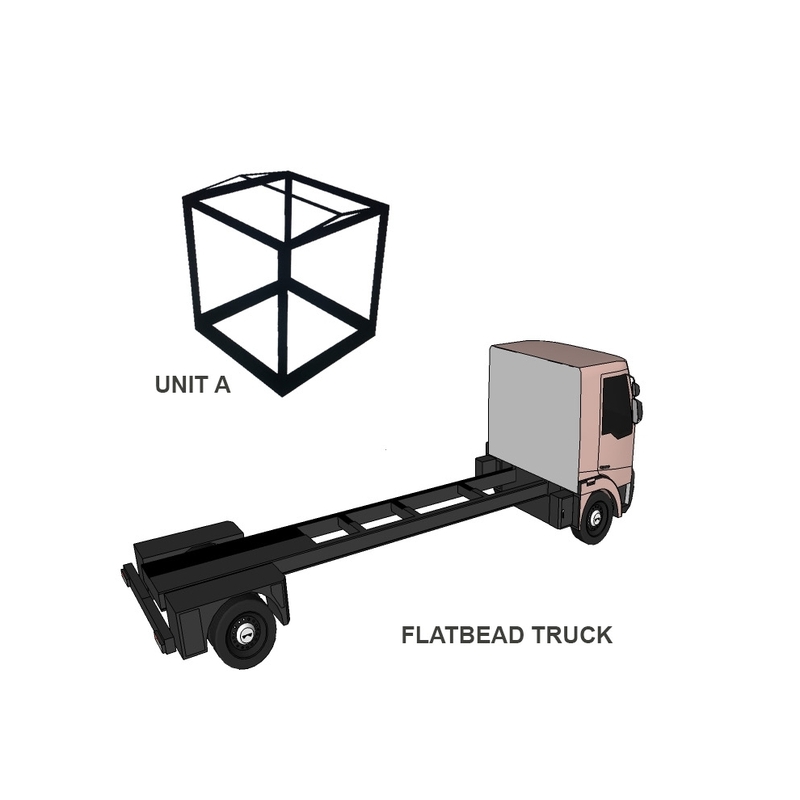 These modules sit atop a FLATBED TRUCK, with units added as the dimension of the truckbed permits. There are a variety of panels for use, each one measuring 8' x 4' in size with thickness determined by material type. These can be placed next to each other to create larger, continuous surfaces and hinged in order to open up and create pockets of space within the truck. We have three types that are used for the exterior: Glass, Screen, and Wood. Each of these have a metal frame and base and are able to be hinged in either direction. Interior panels are used to prompt activity, support program functions, and create ambiance. We have four general types: Collaboration, Living, Healing, and Story. These are metal panels that communicate partnerships, programming, and resources. They are also opportunities for commissioning local street artist works. Regional and local plants and grasses are the feature of the living wall. They may cover the entire wall or be sectioned in one area, depending on environment and caretaking. These walls are thicker and packed with healing salt behind a sturdy canvas. They are a desert rose, are labeled with text, and are heated by lights to activate the healing properties within. Although our stories may be different, we are not alone. These walls are always interactive and allow for individuals to share their stories annonymously either by physical touch or audio. 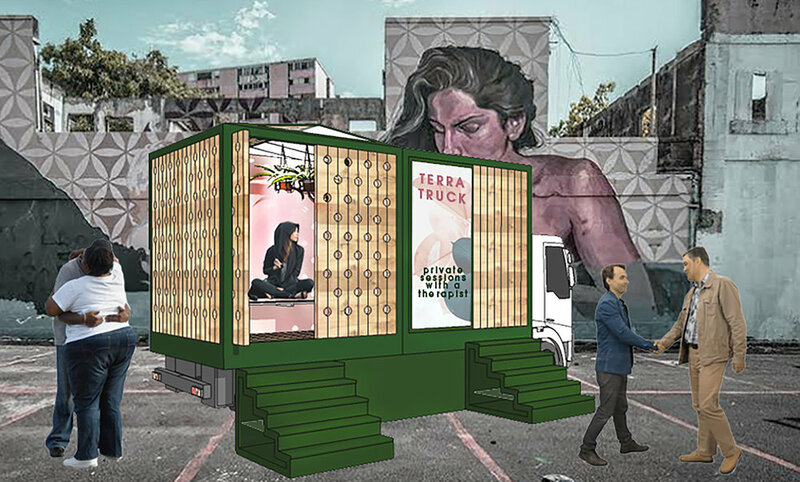 TERRA Mobile is a healing environment that aims to shift mental health stigma by creating experiences that tear down barriers and spark curiosity. With flexibility to accommodate public crisis scenarios, social programming, targeted group education, and one-on-one treatment, our aim is provide a vehicle for outreach and diversity of service offerings. Through organizational collaborations, we will shift individuals from consumers of mental health service to partners in creating healthier communities.